The unitary authority provides a single tier of local government with responsibility for almost all local government functions within the district, including local planning and building control, local roads, council housing, environmental health, markets and fairs, refuse collection, recycling, cemeteries, crematoria, leisure services, parks, and tourism. It is also responsible for education, social services, libraries, main roads, public transport, trading standards, waste disposal and strategic planning, although fire, police and ambulance services are provided jointly with other authorities through the Avon Fire and Rescue Service, Avon and Somerset Constabulary and the South Western Ambulance Service. Its administrative headquarters is in Bath, though many departments are based at offices in Keynsham. The air ambulance and critical care service is provided by the charity Great Western Air Ambulance Charity. The Great Bath at the Roman Baths. The entire structure above the level of the pillar bases is a later reconstruction. Between 2000 and 2104, Bath and North East Somerset Council ran a youth democracy group, Democratic Action for B&NES Youth (DAFBY). The group was consulted by the council and its partners on issues that affected young people. Following a successful petition, a referendum was held on 10 March 2016 proposing a directly elected mayor for Bath and North East Somerset. However, the majority of voters in the district opted to stay with the current system. The district is largely Christian at 71%, with no other religion reaching more than 0.5%. These figures generally compare with the national averages, though the non-religious, at 19.5%, are significantly more prevalent than the national 14.8%. Although Bath is known for the restorative powers of its waters, and only 7.4% of the population describe themselves as "not healthy" in the last 12 months, compared to a national average of 9.2%; only 15.8% of the inhabitants say they have had a long-term illness, as against 18.2% nationally. Bath is connected to Bristol and the sea by the River Avon, navigable via locks by small boats. The river was connected to the River Thames and London by the Kennet & Avon Canal in 1810 via Bath Locks; this waterway – closed for many years, but restored in the last years of the 20th century – is now popular with narrow boat users. Bath is on National Cycle Route 4, with one of Britain's first cycleways, the Bristol & Bath Railway Path, to the west, and an eastern route toward London on the canal towpath. Although Bath does not have an airport, the city is about 18 miles (29 km) from Bristol Airport, which may be reached by road or by rail via Bristol Temple Meads station. Bath is served by the Bath Spa railway station (designed by Isambard Kingdom Brunel), which has regular connections to London Paddington, Bristol Temple Meads, Cardiff Central, Swansea, Exeter St Davids, Plymouth and Penzance (see Great Western Main Line), and also Westbury, Warminster, Salisbury, Southampton Central, Portsmouth Harbour and Brighton (see Wessex Main Line). Services are provided by Great Western Railway. There are suburban stations on the main line at Oldfield Park and Keynsham which have a limited commuter service to Bristol. Green Park station was once operated by the Somerset & Dorset Joint Railway, whose line (always steam driven) climbed over the Mendip Hills and served many towns and villages on its 71-mile (114 km) run to Bournemouth; this example of an English rural line was closed by the Beeching cuts in March 1966, with few remaining signs of its existence, but its Bath station building survives and now houses a number of shops. ^ "Office for National Statistics – Neighbourhood Statistics – Area: Bath and North East Somerset (Local Authority)". Neighbourhood.statistics.gov.uk. Retrieved 1 November 2008. ^ "Stanton Drew Stone Circles". English Heritage Archeometry. Archived from the original on 30 June 2006. Retrieved 8 July 2006. ^ "Stoney Littleton". Stones of England. Archived from the original on 8 March 2008. Retrieved 15 March 2008. ^ Wessex Archaeology. "Archaeological Desk- based Assessment" (PDF). University of Bath, Masterplan Development Proposal 2008. Bath University. Archived from the original (PDF) on 8 September 2011. ^ "Monument No. 204162". Pastscape National Monuments Record. English Heritage. Archived from the original on 4 May 2015. Retrieved 29 May 2011. ^ "Bathampton Camp". Pastscape National Monuments Record. English Heritage. Archived from the original on 4 May 2015. Retrieved 10 May 2011. ^ "The Beaker people and the Bronze Age". Somerset County Council. Retrieved 22 January 2011. 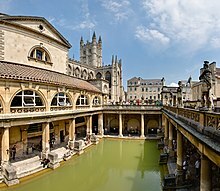 ^ "The Roman Baths". Somerset Tourist Guide. Archived from the original on 1 January 2007. Retrieved 1 November 2007. ^ "Roman Times". Britannia. Archived from the original on 12 November 2006. Retrieved 29 October 2006. ^ "Timeline Bath". Time Travel Britain. Retrieved 10 December 2007. ^ "Bath Abbey". Robert Poliquin's Music and Musicians. Quebec University. Archived from the original on 2 February 2008. Retrieved 18 September 2007. ^ "Alfreds Borough". Bath Past. Archived from the original on 8 December 2007. Retrieved 8 December 2007. ^ "Edgar the Peaceful". English Monarchs – Kings and Queens of England. Retrieved 8 December 2007. ^ a b Powicke, Maurice (1939). Handbook of British Chronology. ISBN 0-901050-17-2. ^ Scott, Shane (1995). The hidden places of Somerset. Aldermaston: Travel Publishing Ltd. pp. 18–19. ISBN 1-902007-01-8. ^ "Bath Abbey". Visit Bath. Retrieved 10 December 2007. ^ "Keynsham Abbey". Images of England. Retrieved 18 July 2007. ^ a b Rodgers, Colonel H.C.B. (1968). Battles and Generals of the Civil Wars. Seeley Service & Co.
^ Burns, D. Thorburn (1981). "Thomas Guidott (1638–1705): Physician and Chymist, contributor to the analysis of mineral waters". Analytical Proceedings including Analytical Communications: Royal Society of Chemistry. 18: 2–6. doi:10.1039/AP9811800002. Retrieved 10 December 2007. ^ Hembury, Phylis May (1990). The English Spa, 1560–1815: A Social History. Fairleigh Dickinson Univ Press. ISBN 0-8386-3391-9. ^ "John Wood and the Creation of Georgian Bath". Building of Bath Museum. Archived from the original on 13 November 2007. Retrieved 8 December 2007. ^ a b "Ralph Allen Biography". Bath Postal Museum. Archived from the original on 4 October 2013. Retrieved 8 December 2007. ^ "Rivers and Canals". Somerset County Council: History of Somerset. Archived from the original on 25 September 2006. Retrieved 29 October 2006. ^ Awdry, Christopher (1990). Encyclopaedia of British Railway Companies. Partick Stephens Ltd. Page 237. ^ Casserley, H.C. (1968). Britain's Joint Lines. London: Ian Allan. ISBN 0-7110-0024-7. ^ "History – Bath at War". Royal Crescent Society, Bath. Archived from the original on 19 May 2007. Retrieved 9 December 2007. ^ "Royal Crescent History: The Day Bombs fell on Bath". Royal Crescent Society, Bath. Archived from the original on 31 January 2008. Retrieved 9 December 2007. ^ "Area Information". Bath and North East Somerset Council. Retrieved 18 June 2011. ^ "About the area". Bath and North East Somerset Council. Archived from the original on 4 November 2007. Retrieved 30 December 2007. ^ Keane, Patrick. "An English County and Education: Somerset, 1889–1902". The English Historical Review. 88 (347): 286–311. doi:10.1093/ehr/LXXXVIII.CCCXLVII.286. ^ "The Avon (Structural Change) Order 1995". legislation.gov.uk. The National Archives. Retrieved 19 March 2011. ^ "Parliamentary Constituencies in the unreformed House". United Kingdom Election Results. Archived from the original on 5 November 2007. Retrieved 9 December 2007. ^ "Bath and North East Somerset Council (All Wards) – Thursday, 7th May, 2015". Bath and North ast Somerset Council. Retrieved 8 May 2015. ^ "A Review of Secondary Schools in Bath". Bath and North East Somerset Council. 14 April 2010. Archived from the original on 21 July 2010. Retrieved 15 July 2010. ^ "Youth democracy put on hold as Council suspends 14-year project". MNR Journal. 16 April 2014. Retrieved 10 April 2019. ^ "Challenging injustice through democratic action" (PDF). Qualifications and Curriculum Authority. Archived from the original (PDF) on 8 October 2011. Retrieved 21 November 2009. ^ "No vote in Bath and North East Somerset mayoral referendum". BBC. Retrieved 20 March 2016. ^ "Elections — Ward Maps". Bath & North East Somerset Council. 31 August 2005. Archived from the original on 21 June 2008. Retrieved 15 November 2009. ^ "Bathampton Parish". Neighbourhood Statistics. Office for National Statistics. Retrieved 31 December 2013. ^ a b c d e f g h i j k l m n o p q r s t u v w "Bathavon RD". A vision of Britain Through Time. University of Portsmouth. Retrieved 4 January 2014. ^ "Batheaston Parish". Neighbourhood Statistics. Office for National Statistics. Retrieved 31 December 2013. ^ "Bathford Parish". Neighbourhood Statistics. Office for National Statistics. Retrieved 31 December 2013. ^ "Cameley Parish". Neighbourhood Statistics. Office for National Statistics. Retrieved 31 December 2013. ^ a b c d e f g h i j k l m n o p q r s t "Clutton RD". A vision of Britain Through Time. University of Portsmouth. Retrieved 4 January 2014. ^ "Camerton Parish". Neighbourhood Statistics. Office for National Statistics. Retrieved 31 December 2013. ^ "Charlcombe Parish". Neighbourhood Statistics. Office for National Statistics. Retrieved 31 December 2013. ^ "Chelwood Parish". Neighbourhood Statistics. Office for National Statistics. Retrieved 31 December 2013. ^ "Chew Magna Parish". Neighbourhood Statistics. Office for National Statistics. Retrieved 31 December 2013. ^ "Chew Stoke Parish". Neighbourhood Statistics. Office for National Statistics. Retrieved 31 December 2013. ^ "Claverton Parish". Neighbourhood Statistics. Office for National Statistics. Retrieved 31 December 2013. ^ "Clutton Parish". Neighbourhood Statistics. Office for National Statistics. Retrieved 31 December 2013. ^ "Combe Hay Parish". Neighbourhood Statistics. Office for National Statistics. Retrieved 31 December 2013. ^ "Compton Dando Parish". Neighbourhood Statistics. Office for National Statistics. Retrieved 31 December 2013. ^ a b c "Keynsham UD". A vision of Britain Through Time. University of Portsmouth. Retrieved 4 January 2014. ^ "Compton Martin Parish". Neighbourhood Statistics. Office for National Statistics. Retrieved 31 December 2013. ^ "Corston Parish". Neighbourhood Statistics. Office for National Statistics. Retrieved 31 December 2013. ^ "Dunkerton Parish". Neighbourhood Statistics. Office for National Statistics. Retrieved 31 December 2013. ^ "East Harptree Parish". Neighbourhood Statistics. Office for National Statistics. Retrieved 31 December 2013. ^ "Englishcombe Parish". Neighbourhood Statistics. Office for National Statistics. Retrieved 31 December 2013. ^ "Farmborough Parish". Neighbourhood Statistics. Office for National Statistics. Retrieved 31 December 2013. ^ "Farrington Gurney Parish". Neighbourhood Statistics. Office for National Statistics. Retrieved 31 December 2013. ^ "Freshford Parish". Neighbourhood Statistics. Office for National Statistics. Retrieved 31 December 2013. ^ "High Littleton Parish". Neighbourhood Statistics. Office for National Statistics. Retrieved 31 December 2013. ^ "Hinton Blewett Parish". Neighbourhood Statistics. Office for National Statistics. Retrieved 31 December 2013. ^ "Hinton Charterhouse Parish". Neighbourhood Statistics. Office for National Statistics. Retrieved 31 December 2013. ^ "Kelston Parish". Neighbourhood Statistics. Office for National Statistics. Retrieved 31 December 2013. ^ "Keynsham Parish". Neighbourhood Statistics. Office for National Statistics. Archived from the original on 1 January 2014. Retrieved 31 December 2013. ^ "Marksbury Parish". Neighbourhood Statistics. Office for National Statistics. Retrieved 31 December 2013. ^ "Midsomer Norton Parish". Neighbourhood Statistics. Office for National Statistics. Retrieved 31 December 2013. ^ a b c "Norton Radstock UD". A vision of Britain Through Time. University of Portsmouth. Retrieved 4 January 2014. ^ "Monkton Combe Parish". Neighbourhood Statistics. Office for National Statistics. Retrieved 31 December 2013. ^ "Nempnett Thrubwell Parish". Neighbourhood Statistics. Office for National Statistics. Retrieved 31 December 2013. ^ "Newton St Loe Parish". Neighbourhood Statistics. Office for National Statistics. Retrieved 31 December 2013. ^ "Norton Malreward Parish". Neighbourhood Statistics. Office for National Statistics. Retrieved 31 December 2013. ^ "Paulton Parish". Neighbourhood Statistics. Office for National Statistics. Retrieved 31 December 2013. ^ "Peasedown St John Parish". Neighbourhood Statistics. Office for National Statistics. Retrieved 31 December 2013. ^ "Priston Parish". Neighbourhood Statistics. Office for National Statistics. Retrieved 31 December 2013. ^ "Publow Parish". Neighbourhood Statistics. Office for National Statistics. Retrieved 31 December 2013. ^ "Radstock Parish". Neighbourhood Statistics. Office for National Statistics. Archived from the original on 1 January 2014. Retrieved 31 December 2013. ^ "Saltford Parish". Neighbourhood Statistics. Office for National Statistics. Retrieved 31 December 2013. ^ "Shoscombe Parish". Neighbourhood Statistics. Office for National Statistics. Retrieved 31 December 2013. ^ "Southstoke Parish". Neighbourhood Statistics. Office for National Statistics. Retrieved 31 December 2013. ^ "Stanton Drew Parish". Neighbourhood Statistics. Office for National Statistics. Retrieved 31 December 2013. ^ "Stowey-Sutton Parish". Neighbourhood Statistics. Office for National Statistics. Retrieved 31 December 2013. ^ "Swainswick Parish". Neighbourhood Statistics. Office for National Statistics. Retrieved 31 December 2013. ^ "Timsbury Parish". Neighbourhood Statistics. Office for National Statistics. Retrieved 31 December 2013. ^ "Ubley Parish". Neighbourhood Statistics. Office for National Statistics. Retrieved 31 December 2013. ^ "Wellow Parish". Neighbourhood Statistics. Office for National Statistics. Retrieved 31 December 2013. ^ "Westfield Parish". Neighbourhood Statistics. Office for National Statistics. Retrieved 31 December 2013. ^ "West Harptree Parish". Neighbourhood Statistics. Office for National Statistics. Retrieved 31 December 2013. ^ "Whitchurch Parish". Neighbourhood Statistics. Office for National Statistics. Retrieved 31 December 2013. ^ a b "Bath and North East Somerset UA 2001 Census". National Statistics. Archived from the original on 2 November 2007. Retrieved 9 December 2007. ^ "Bath and North East Somerset: Total Population". A Vision of Britain Through Time. Great Britain Historical GIS Project. Retrieved 13 December 2007. ^ "Regional Gross Value Added" (PDF). Office for National Statistics. pp. 24–253. Archived from the original (PDF) on 26 February 2007. Retrieved 20 October 2015. ^ "Bristol/Bath to South Coast Study – FINAL REPORTS PUBLISHED". Government News. 13 February 2004. Archived from the original on 14 April 2013. Retrieved 28 September 2012. ^ "Secondary School Reviews". Bath and North East Somerset Council. Archived from the original on 11 June 2008. Retrieved 23 June 2008. ^ "LDF Contextual Info" (Excel). Intelligence West. Retrieved 14 December 2007. ^ "History of the University". University of Bath. Archived from the original on 12 November 2007. Retrieved 10 December 2007. ^ "Departments". University of Bath. Archived from the original on 11 December 2007. Retrieved 10 December 2007. ^ a b "Bath Spa University". Bath Spa University. Archived from the original on 9 December 2007. Retrieved 10 December 2007. ^ "The Rec". Bath Rugby. Archived from the original on 24 September 2010. Retrieved 28 September 2010. ^ "Bath Half Marathon". Archived from the original on 11 October 2008. Retrieved 9 December 2007. ^ "Chew Valley Sailing Club". Archived from the original on 24 April 2006. Retrieved 12 May 2006. ^ "1 to 20 Lansdown Crescent". Images of England. Archived from the original on 2 May 2015. Retrieved 14 November 2006. ^ "Royal Crescent". Images of England. Retrieved 14 November 2006. ^ "Pulteney Bridge". Images of England. Archived from the original on 28 April 2015. Retrieved 14 November 2006. ^ "Victoria Art Gallery". Images of England. Archived from the original on 15 June 2009. Retrieved 15 November 2006. ^ "Holburne of Menstrie Museum". Images of England. Archived from the original on 28 April 2015. Retrieved 15 November 2006. Wikimedia Commons has media related to Bath and North East Somerset District.